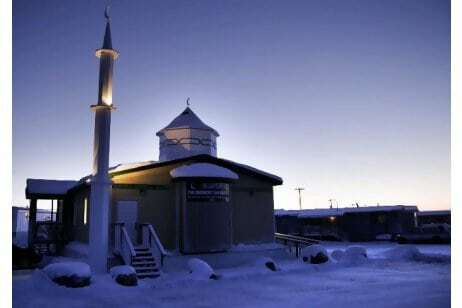 The fascinating story of the Midnight Sun Mosque, the world’s northernmost mosque, is now being made into a documentary film by Canadian filmmakers, Saira and Nilufer Rahman. The film, to be called Arctic Mosque, will tell the story of the 4,000 km journey the mosque took in 2010 from the prairie city of Winnipeg in the province of Manitoba where it was built, to Inuvik, the most northern town in Canada’s Arctic. The documentary will also offer a revealing portrait of Islamic life in the far north. “When we heard about the story of the mosque project, we immediately thought it was unusual and would definitely make a great story for a documentary,” Saira Rahman told OnIslam.net. “Actually, two days before the mosque set out on its 4,000 km journey, Hussain Guisti, the general manager of the Zubaidah Tallab Foundation (the Canadian charity that sponsored the mosque building), asked us if we’d be interested in making a film about the “Arctic Mosque”. The small Muslim community in Inuvik could not afford to build a new mosque as prices for labor and materials in the arctic region are much higher than in southern parts of Canada. The Zubaidah Tallab Foundation, a Manitoba-based Islamic charity, stepped in, raised funds and found a supplier of prefabricated buildings in Manitoba that said it could ship the building to Inuvik for half the price of building a mosque from scratch in the town. The epic journey of small prefabricated mosque grabbed international attention as it slowly made its way, by road and on a river barge, to its final destination. Inuvik is in Canada’s Northwest Territories and has a population of 3,600 people, about a hundred of who are Muslims. Due to its northern location, Inuvik is called the “Light of the Midnight Sun” as it experiences an average of 56 days of continuous sunlight every summer and, for almost 30 days, it is blanketed in complete darkness every winter. The Muslims of Inuvik follow the prayer and fasting times of the city of Edmonton. The filmmakers are hoping to capture the drama of the mosque’s odyssey and change the perception about Muslims in a world that often responds to mosques with fear and controversy. The documentary is being co-produced by Buffalo Gal Pictures and Snow Angel Films, which is owned by the two sisters, Nilufer and Saira Rahman. The sisters are currently in post production, going through 120 hours of footage, while seeking funding for the documentary. They have launched an online campaign and the response has been encouraging. TORONTO – The fascinating story of the world’s northernmost mosque, The Midnight Sun Mosque, is inspiring Canadian filmmakers to turn it into a documentary. “When we heard about the story of the mosque project, we immediately thought it was unusual and would definitely make a great story for a documentary,” filmmaker Saira Rahman told OnIslam.net. Saira and Nilufer Rahman are making a documentary about the Midnight Sun Mosque in Inuvik in Canada’s Northwest Territory. Titled “Arctic Mosque”, the documentary will tell the story of the 4,000km journey the mosque took in 2010 from the prairie city of Winnipeg in the province of Manitoba to Inuvik, the most northern town in Canada’s Arctic. “Actually, two days before the mosque set out on its 4,000 km journey, Hussain Guisti, the general manager of the Zubaidah Tallab Foundation (the Canadian charity that sponsored the mosque building), asked us if we’d be interested in making a film about the “Arctic Mosque,” said Saira. The Zubaidah Tallab Foundation, a Manitoba-based Islamic charity, stepped in and raised funds to build the mosque. “We hope that people who watch the film will discover that this documentary is so much more than a story about the building of a mosque,” Saira told OnIslam.net. Saira says that the film will show the impact the mosque has made on the small town. “The Midnight Sun Mosque, as it’s been named, has impacted the entire town of Inuvik and put it on the map, so to speak. The documentary is being co-produced by Buffalo Gal Pictures and Snow Angel Films, which is owned by the two sisters, Nilufer and Saira Rahman. The sisters are currently in post production, going through 120 hours of footage, while seeking funding for the documentary. They have launched an online campaign and the response has been encouraging. “After only three days of posting our trailer on YouTube, we got over 10,000 views,” said Saira. Muslims make around 1.9 percent of Canada’s 32.8 million people and Islam is the number one non-Christian faith in the Roman Catholic country.